This scene has the word epic written all over it. It reminds me of Superman lifting the car on the cover of Action Comics demonstrating the true strength, grit and determination of the superhero. 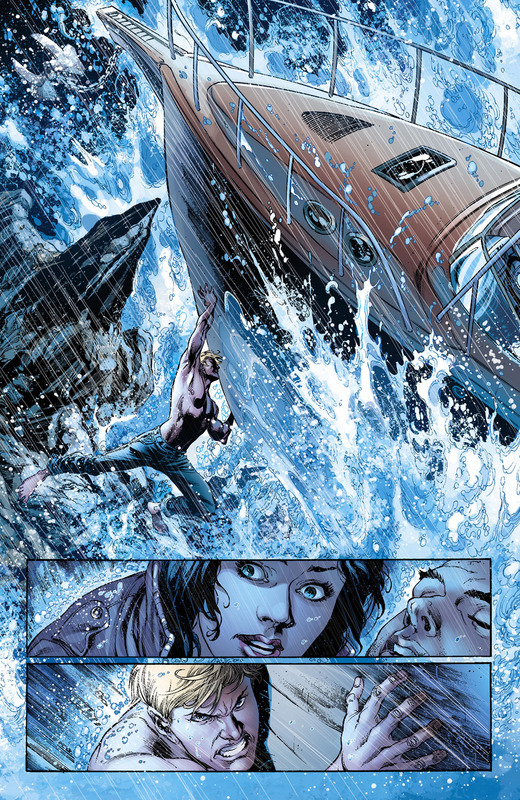 There are many aspects of this scene that makes Arthur Curry look incredible; the rain which is so vividly drawn making it look incredibly wet and dangerous, the sheer mass of the boat, the dangerous rock edges and the fact that Aquaman is bare feet with an arched back lifting the yacht. The extra panels add to the scene but to be honest the main panel says it all. The colouring takes a dark water scene and gives it pure clarity. This is just excellent artwork demonstrating how to make a superhuman feat look just that.